I was merrily going about my evening relaxation routine, lounging in comfy clothes and getting ready to wind down with a good book when my kittys were anxiously waiting to come inside for dinner. At this point I was actually singing aloud some silly song I had made up about the cats coming in for dinner and I as I came up the two steps from our sunroom completely in another world of joyful delusion boom I hit the floor! Remember that part about the comfy clothes? well I was wearing a pair of sweat pants that albeit extremely cozy were about three sizes too big and too long consequently I tripped on them with all my weight landing on my left knee. At the time my merriment turned into a comical cry but I really thought nothing of it and picked myself up, along with the plant that suffered some damage on my way down, and continued on with my evening feeling some mild discomfort that faded by morning. 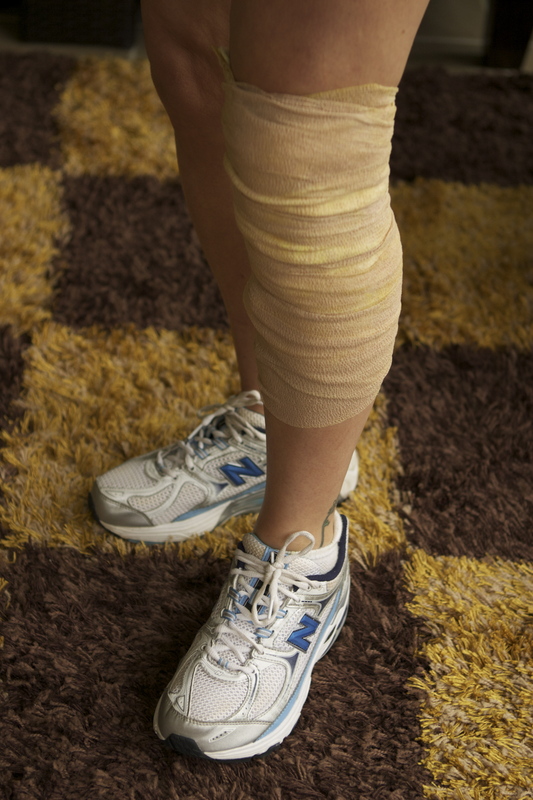 As I am often guilty of doing I went on with my exercise routine as planned and ignored the lingering pain in my knee until it got to the point where the swelling was unbearable and I could barely walk without a limp. Finally I made my way to the doc’s office and she confirmed either a mild tear in my MCL (medial collateral ligament) or a severe strain and prescribed a combination of rest, anti-inflammatory pharmaceuticals. and supporting my knee with a brace until pain had subsided and the ligament was healed. Never one to give into medical convention I threw out the prescription for the anti-inflammatory drugs and my mind began racing of how I was going to heal this naturally with diet, supplements, home remedies and figure out a way to adapt my workout routine to accommodate an injury. So here’s what I did…. 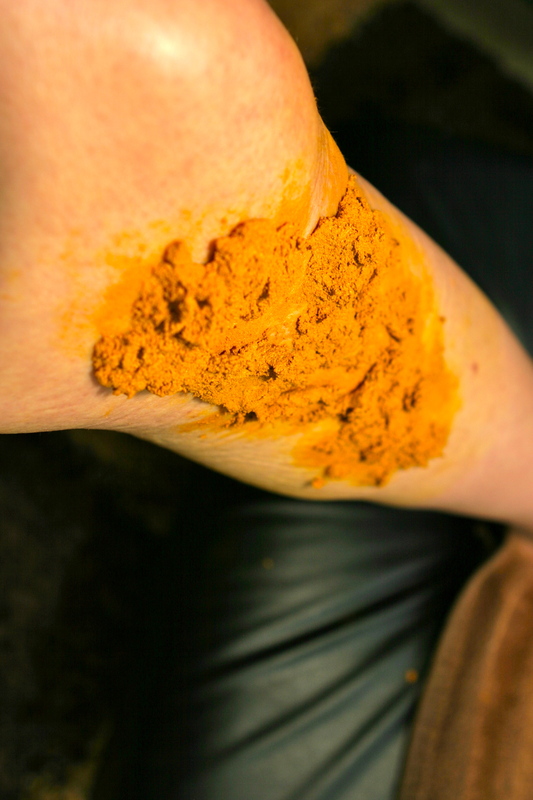 A friend and colleague mentioned that in Iran her family has used a traditional method of healing injuries to joints and bones with a paste made from egg yolk and tumeric. Being a nutritionist and lover of any natural home remedy I was very excited to try this and found amazing results. So simple and inexpensive this is a fantastic remedy to reduce swelling and inflammation, relieve pain, and speed the healing process. 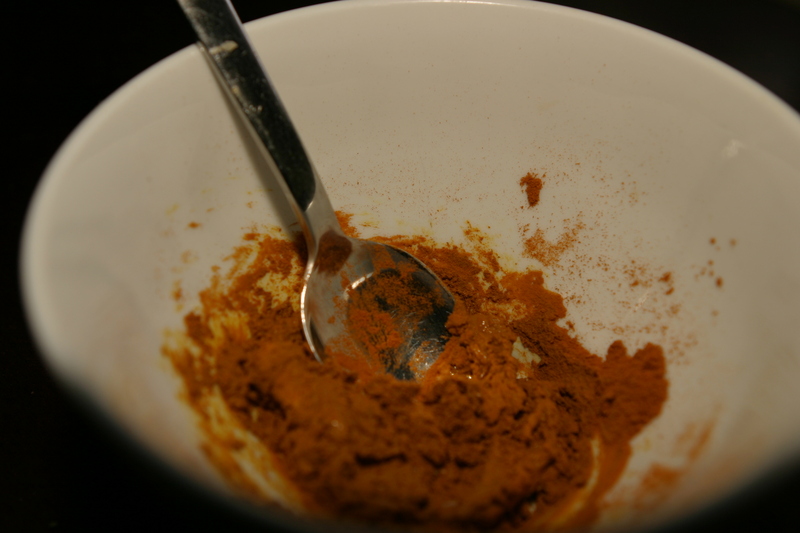 Simply mix the egg yolk and tumeric into a paste and apply to the affected joint (do not apply to broken skin or open wounds). I suggest doing this over a towel you don’t mind ruining and using some gloves. I learned this the hard way after cleaning up stubborn tumeric stains from our kitchen floor and having bright yellow stained hands for a good part of the day!! Looks a bit gross I know!! Then wrap the joint with a cotton cloth to cover, an old t-shirt cut into strips works best (organic white cotton is preferable to avoid dyes etc. penetrating the skin) and follow up by wrapping with a tensor bandage to give the joint some extra support. You can leave this on for as long as possibly comfortable. When at home I left it on all day, worked out with it on, and even wore it under my pants when out and about seeing clients. When you are ready to remove the bandage I suggest doing this outside to avoid tumeric egg yolk crumbles all over your floor and bath tub, again a lesson learned the hard way. Your skin will be a glorious bright yellow hue, but don’t panic this will wash off in the shower and fade over time. 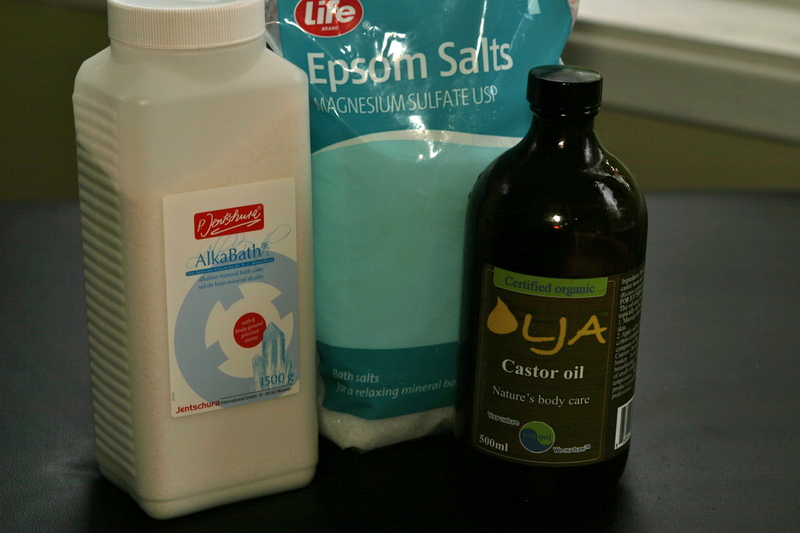 On the advice of my mother who always has home remedies for anything that ails you, I also took epsom salt baths daily with an added boost of a product called Alka Bath, which is a detoxifying mineral bath salt combination with semi-precious stones and by far one of my favorite products ever! After the baths I followed up with a castor oil massage on the affected knee, again on the advice of my wise mother. 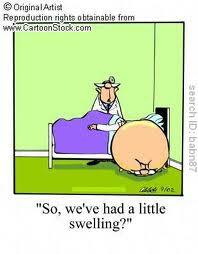 These treatments significantly helped with the pain, discomfort, and swelling phew! Pumpkin seed oil, which is high in zinc (this raw pumpkin seed oil is made from Styrian pumpkin seeds which is the best I have ever tasted, the actual raw Styrian pumpkin seeds are super yummy too!!) goji berries, golden berries, and red peppers all extremely good sources of vitamin C, bee pollen which is an excellent source of amino acids as well as a whole host of vitamins, minerals, and enzymes necessary for healing (Honeycombe Botanicals has the best bee pollen I have ever tried!!) 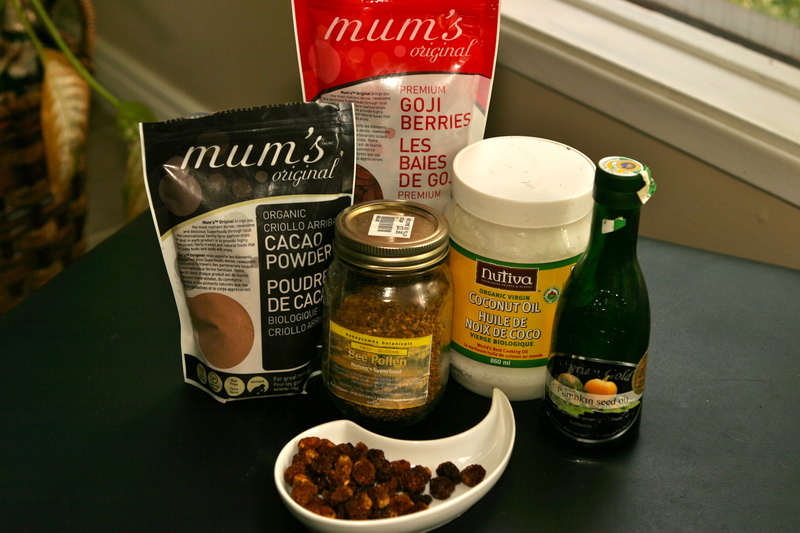 , coconut oil which has amazing anti-inflammatory properties, and raw cacao which also has significant anti-inflammatory properties and an abundance of antioxidants necessary for healing. As well as incorporating these foods I also have either a green juice, super smoothie or both daily, which is always a part of my routine but even more important when in the healing process. 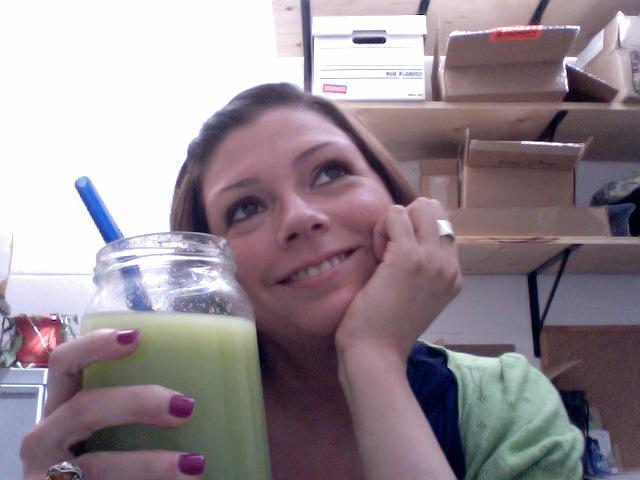 enjoying green juice and day dreaming of running through the park someday day soon! 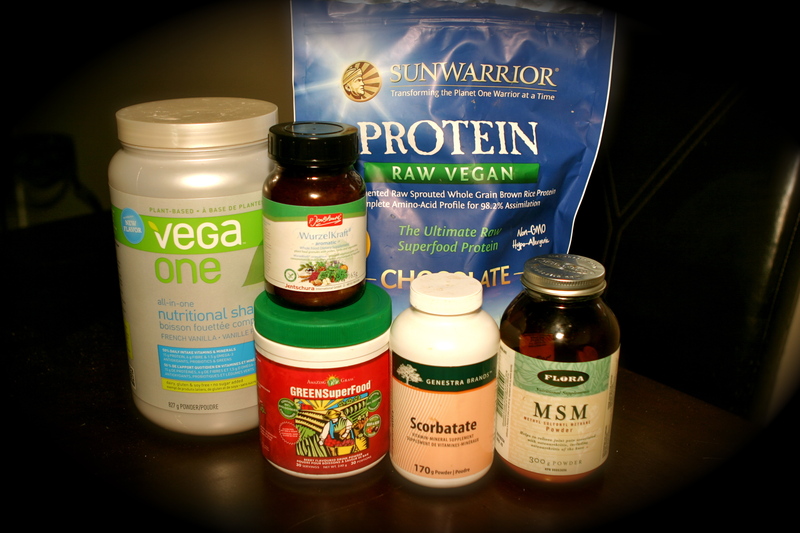 You will notice that I mention supplementation last because I strongly believe that natural supplements are wonderful additions to any protocol but they should be secondary to a healthy diet and lifestyle modifications. 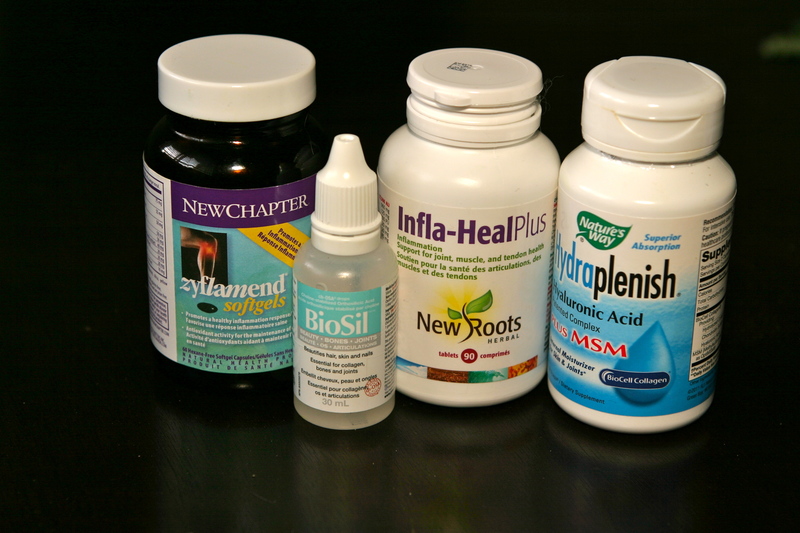 The supplements I have chosen to add to my healing regime are mainly to reduce pain, inflammation, and stiffness in my knee and provide a combination of proteolytic enzymes and essential nutrients needed to heal and remineralize the tissues in the knee joint. 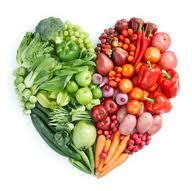 I am also a huge fan of using homeopathic remedies to stimulate the body’s natural self healing process…. 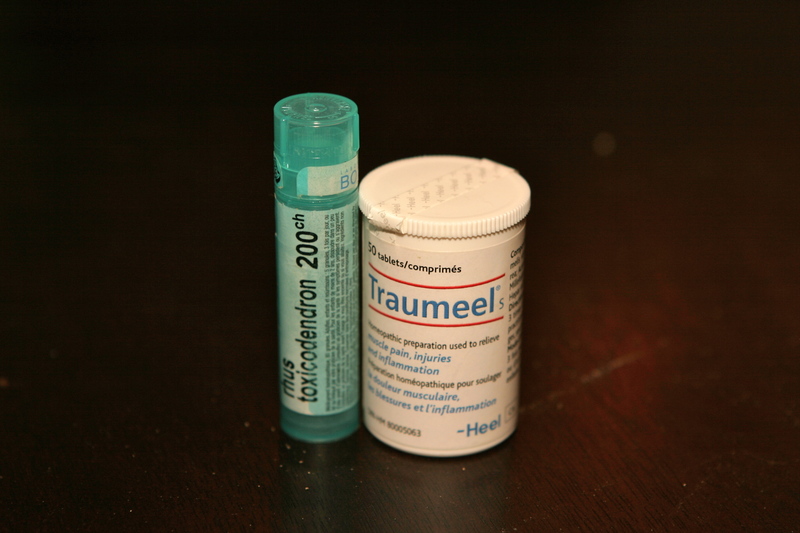 Traumeel and rhus tox were the right remedies for me however, you should always choose homeopathic remedies based on individual symptoms and it is best to consult a homeopathic practitioner to find the best remedies for your constitution and manifestation of symptoms. At first I could barely put any weight on my left leg so I thought this would be the perfect time to work on upper body conditioning and core strength. Before my workout I made sure my knee was supported properly with a tensor bandage and flexible knee brace, which is very important to prevent further injury (although I do not have the extra brace on in the picture below as my knee was feeling pretty good that day). Then I used a combination of pilates and yoga mat exercises combined with upper body circuits with high reps and low weight done in a seated position. My traditional workouts, prior to injury, generally consisted of more functional fitness type moves with compound exercises but in this case I had to draw on my old school knowledge and figure out a way to get in cardiovascular training and strength conditioning without the use of my whole body. Once I could put more weight on my knee I also incorporated upper body cardio moves, boxing style which really got me working up a sweat. In the end I had some pretty fierce workouts without the use of my lower body, my core and upper body are very grateful for the experience. So what did I learn from all of this? I definitely have reinforced a sense of confidence in my body’s own ability to heal, which has never failed me. I have learned that sometimes you need to be pushed out of your comfort zone and routine to learn new things about yourself and what you can achieve. 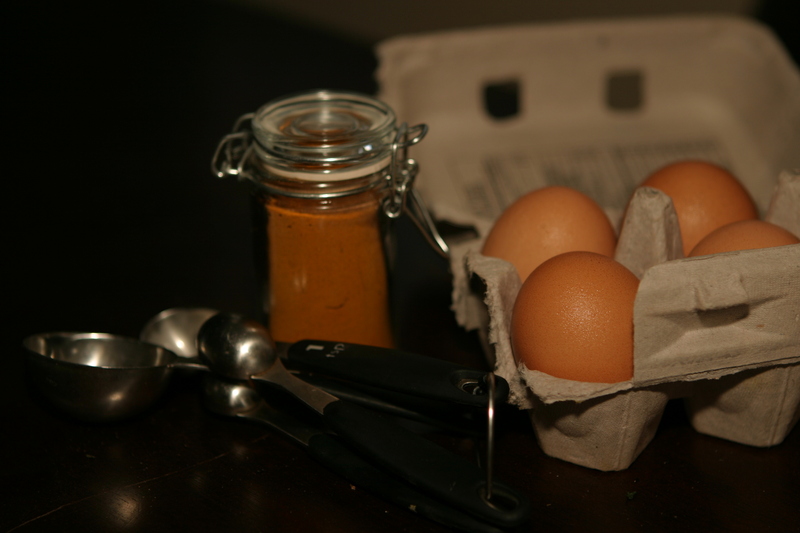 I have learned that I have a culinary medicine cabinet in my kitchen just waiting to be called upon if needed and I have all the tools necessary for making self healing home remedies, with the exception of eggs and a few extra supplements, right in my own pantry. One of the biggest realizations was understanding that the importance of appropriate time for rest and time for movement need to be acknowledged, I suppose the Universe will keep reminding me of this lesson until I get it right! And finally for the most important lesson, retire those baggy sweat pants…I haven’t worn them since, boxer shorts and a warm blanket have become my new comfy cozy.